I fell in love with Vincent Van Gogh when I was a teenager and started looking into art. His paintings marveled me. I loved the colors and textures, but most of all, I loved the feelings I could sense from his paintings. As years passed by, I became even more passionate about Van Gogh, especially after knowing his life story. I know I am not alone in my passion for Van Gogh, and I knew one person in particular who loved him more than even me: my friend Liliana Saraiva. She accompanied me in my craziness for him, and with her, I had long conversations about his paintings and his life. 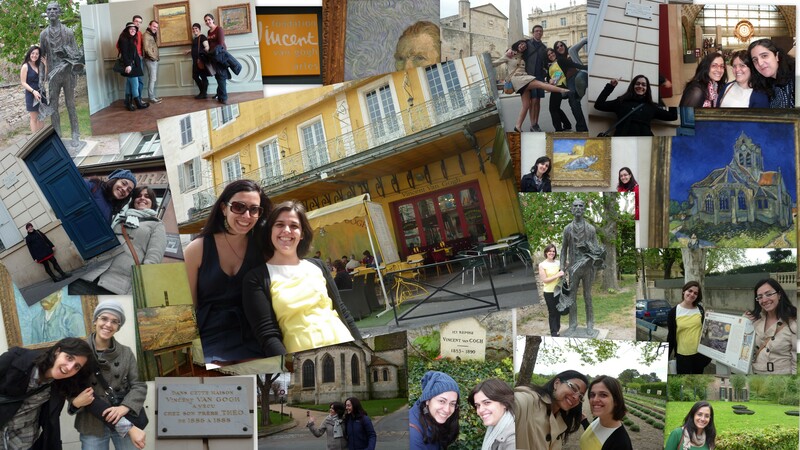 But most of all, together, we visited the most emblematic places in Van Gogh’s life: Auvers-Sur-Oise, Arles, St. Remy en Provence, Theo’s House in Paris, etc. Liliana fought a long battle against a devastating decease, and at the age of 30 left this world. Today would be her 32nd birthday, and this post, and the review of a book that combines both our mutual love for Van Gogh, and my love for Pride and Prejudice, are my present to her. This the small tribute I can offer, and I like to believe that if she were here, she would be smiling with the contagious and open smile she always had. Elizabeth and Van Gogh takes place in 1888 in the Southern French village of Arles, and will show us the last years of Vincent Van Gogh’s life. In this cross over between Pride and Prejudice and Van Gogh’s life, Elizabeth’s love story will not be the main storyline as we will read about an intense and special friendship Elizabeth created with Van Gogh, and see how that friendship will influence the course of her life. I think it is important to advise you that the characters we see in this book are not the same ones from the original book placed in a different era, they are descendants of Darcy and Elizabeth, and for that reason, their personalities are different. So don’t expect to encounter our beloved Lizzy and Mr. Darcy, you will see Cassandra Elizabeth Bennett and William Darcy. Elizabeth is a washerwoman and an aspiring artist who is currently living with her aunt and Uncle Gardiner, and William Darcy is an American artist who comes to visit his aunt Catherine de Bourgh in Arles. Portraying both characters as artists was a twist I really enjoyed, even though I could not picture Darcy as a painter. 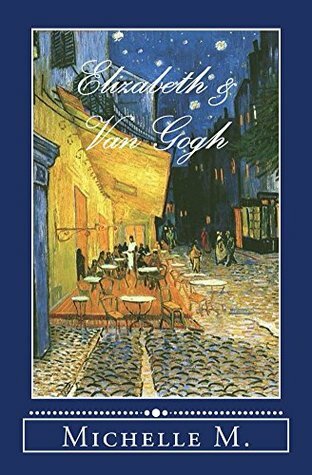 Apart from Elizabeth and Darcy, the other main character in this book is Vincente Van Gogh, and the story starts with him living in the Yellow House at Arles with Elizabeth and Jane being the only friends who genuinely care for him. He is living with Paul Gauguin, but Gauguin is what I would picture him to be: a selfish being who does not care for Vincent and is only interested in his mistresses. Elizabeth dislikes Paul Gauguin as much as I do, and knowing the author has the same opinion as me concerning this painter was something I found very shooting. I also liked the implication the author does regarding his involvement in the ear incident, and wonder if that was what really happened. I loved the idea of P&P crossing over with Van Gogh’s life, it was the perfect premise for me, but unfortunately I did not love the book. It had some interesting ideas behind it, but I don’t think it was as accomplished as it could have been. I didn’t feel much intensity in Elizabeth and Darcy’s love and I could not relate to these new characters as I did with the Darcy and Elizabeth from 1812. Also, the ending was very disappoint for me. Darcy is placed in a position where he needs to choose between Elizabeth and his wealth and, he gives up on Elizabeth and their love. He does this after declaring to love her and making her go across the ocean with him to meet his family. I cannot believe our Darcy would give up on Elizabeth after he had acknowledged he loved her, nor do I believe our Elizabeth would forgive him so easily. I know these are not the same characters, but I truly did not like to see Darcy as a coward who would just let Elizabeth go after having admitted he loved her. There were some other aspects in the book that I believe not to have been very well accomplished: Elizabeth introduces herself to Darcy as Cassandra, and at Rosa Parie everyone called her that, however without any explanation Darcy started calling her Elizabeth a bit later. Furthermore, I could not understand the reasons behind Darcy’s insult to Elizabeth at the art exhibition. I believe it was an attempt to establish a link between this book and the original insult at the Meryton Assembly, but it seemed to me a little forced. I did like to see the author use the colors to create a metaphor with people’s personalities. I think it was very interesting and a plus to the book. I also enjoyed Col. Fitzwilliam’s character as he was interesting and intriguing. While reading the book I always felt curious about what he was discovering and what secrets he was hiding. Overall, I liked reading this book because it made me wonder about Van Gog’s life. Might he have lived longer had he someone like Elizabeth at his side? Would his fate be the same? And what about his paintings, would they change with the presence of a friend who believed in him? The friendship between Vincent and Elizabeth was something I could related with, and I enjoyed reading the scenes between these 2 characters, but the love story between Elizabeth and Darcy did not captivated me and that is why I did not gave a higher rate to this book. It is very different and creative Denise. Just can’t imagine Darcy pledging his love for Lizzy and then abandoning her for his wealth and riches. It doesn’t ring true somehow. As for Lizzy forgiving him easily , I’m not sure about that either. However,as they are descendants of Austen’s Darcy and Lizzy,perhaps their devotion and love of each other has been diluted throughout the years….? Ahhhh, that is precious that you read this with your friend’s memory in mind. Love that! I don’t know as much about Van Gogh other than the a few facts, but I love that P&P is set in the art world. Too bad the characters and the romance didn’t quite live up to such promise for a story mash-up. Interesting choices the author made. I’m curious to read it. Thanks Sophia! It was very different indeed, and I think the ideas behind the book were interesting, I was only sorry the execution was not what I expected. But I will still read other books from this author, I do believe she has a lot of potential 🙂 Let us know your opinion if you read it. Thanks for sharing such personal thoughts with us, and for the great review for thins intriguing story, it sounds like a fascinating read! Thanks Joana! It is not my favorite romance, but it is a very different variation, and I did love to read about Van Gogh. A Liliana teria gostado que lhe dedicasses este texto no seu dia de anos. Enfim! Custa um bocado pensar neste assunto. Foi bonito. Isso sem dúvida que foi. I was intrigued at the topic, as I too am deeply moved by van Gogh’s work. Many times in my life, they’ve sadly mirrored my own mood. Fortunately for me, I have 21st century medical research that has lifted me from those depths of despair. I’d have considered reading this book but the negatives you mention give me pause. Darcy giving up Elizabeth for his wealth is a no-go for me. It makes me sad, as I may be missing some other aspects that are truly moving. But the friendship between Elizabeth and Vincent is endearing and I truly loved having Van Gogh in this story. My comment is probably a bit off topic, I realise but I wanted to mention my favourite cross over story featuring Vincent Van Gogh. I have to put my sci-fi geek hat on now instead of my Janeite bonnet. There’s a TV series in the UK called Doctor Who which some of you may have heard of. One of it’s best episodes, imho, is called Vincent and the Doctor. The time travelling Doctor and his companion meet Vincent and eventually show him how much his work was appreciated after his death. Rita, thanks for sharing your memories of your friend. Her life was far too short, as was Vincent’s. It’s curious Anji, this is not the first time I hear about Doctor Who, and specifically the episode with Vincent! Rellaenthia also told me about it, but I have never seen it. I think I would cry watching that episode! It seems really touching. There is a song I love from Don McLean, I think, that is about Vincent Van Gogh that says “this world was never meant for one as beautiful as you”, and I agree, the world was not ready for Vincent Van Gogh at the time. It would make me happy to know that he got a chance to know that his work was appreciated and loved by billions of people. By the way, I’m also a proud sci-fi geek 🙂 Good to know I’m not alone in that. I honor the idea you are remembering your special friend with this book and I am sure I would like Van Gogh’s story BUT to do what I read you did with ODC’s love story doesn’t sit well with me. I LOVE Josh Groban singing “Vincent”. And I have used note cards with his art work so like that part in the telling of this tale.